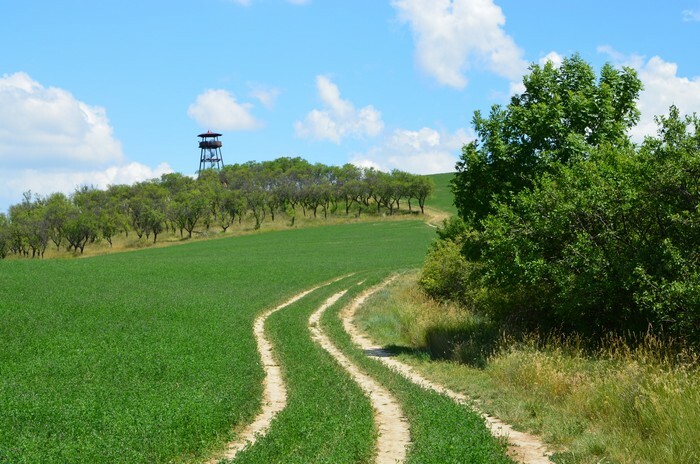 Dear visitors, we offer you a journey along a trail, which will lead you to the new lookout tower and to two almond orchards - the only ones in the Czech Republic. You can also see many other beautiful places along the way. The trail is less than 9 km long; you can also use a shortened route, which is about 5 km long. However, the shorter route only includes the orchard with the lookout tower on the Hustopečský starý vrch hill. You can relax in the gazebo next to the Front Pond (Přední rybník) and then at three outdoor seating areas along the way. 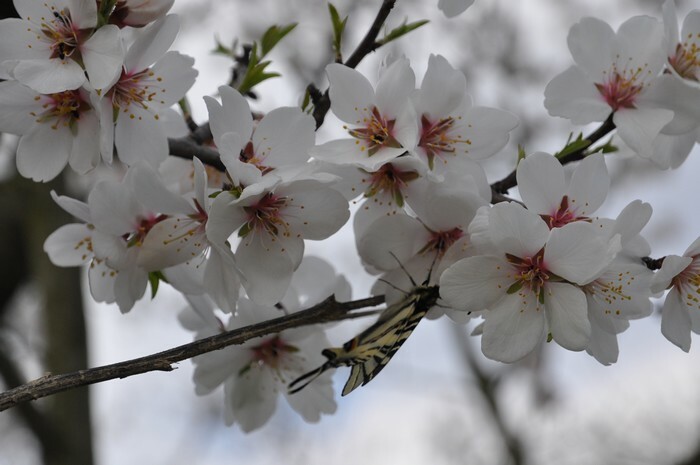 You can learn about the almond trees, about the surrounding nature and landscape and its use on seven information boards. The Almond Trail is only intended for pedestrians and cyclists. Driving motor vehicles is prohibited, so leave them at one of the car parks. If you begin your trip next to the Pavučina Youth Centre, the first part of the trail is parallel to the red tourist trail next to the Czech Tourists Club (marked with red tourist signs). The Almond Trail then turns off the red tourist trail next to the Kamenný Vrch (Stone Hill) nature reserve. From then on, it is marked with yellow arrows with a symbol of a lookout tower. If you want to go along the shorter route, you must turn off the red trail next to the Přední rybník (Front Pond) onto the trail marked with yellow arrows. Nevertheless, you can also go along the trail in the opposite direction from the local cemetery (located next to the road to Kurdějov). 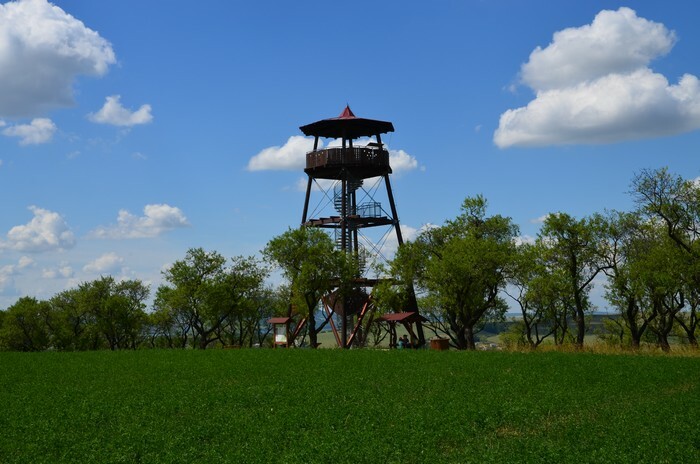 The Lookout Tower stands on the edge of the almond orchard on Hustopečský starý vrch at an altitude of about 300 m. Its overall height is 17.4 m, while the viewing platform is at a height of 12.6 meters. It was designed by Ing. Antonín Olšina and Ing. Martin Novák. It was built by the company TEPLOTECHNA Ostrava a.s. The main supporting columns are made of larch wood, flooring from oak and other wooden parts are of spruce. It was opened on March 31, 2012. The history of the cultivation of almond trees in the Czech lands dates back to the 17th century. However, the first really large orchards were planted in Hustopeče in 1949 in the pursuit of self-sufficiency of the socialist economy. About 50,000 almond trees grew on 185 hectares in Hustopeče in the peak times of the 1960s. Nevertheless, cultivation of almonds became uneconomic and thus the orchards were gradually reduced, until only two of them remained in the late eighties. After the changed social and economic conditions after 1989, there was no interest in the harvest from these orchards, so they remained totally neglected and unkempt. Many years without maintenance and pruning of the trees led to a dense concentration of branches in the treetops, their drying and frequent fracturing. Unwanted types of trees began to grow in the orchards, including the invasive locust tree. The town of Hustopeče acquired part of the orchards during the adjustment of land ownership in 2004 and the town also bought another significant part of the orchards in 2008. The ownership of the orchards created conditions for ensuring continued systematic care. The trees were pruned in 2007 - 2009, invasive trees were removed and two information boards were installed. The orchard near Kamenec has a total of 1.7 hectares and about 400 trees grow in it. The second orchard on the hill Hustopečský starý vrch includes approximately 530 almond trees over an area of about 2.7 ha. The orchards are planted in exceptionally well-preserved and protected surroundings, which is another reason why these places are worth visiting. They are literally surrounded by sites, which are among the best in the Czech Republic and the European Union. This is why they were included in the European Natura 2000 network, which protects the most vulnerable habitats and plant and animal species in the European Union. Kamenný Vrch u Kurdějova, an important European natural locality, is adjacent to the orchard in Kamenec from both the south and the north. It protects the habitat of steppe grasslands, small areas of oak-hornbeam forests and the orchid Viper's bugloss (echium maculatum). You can find other rare species here, for example greater pasque flower, snowdrop anemone, pheasant's eye and military orchid. Přední kopaniny, another significant European natural locality, is adjacent to the orchard on the Hustopečský starý vrch hill and it was included in Natura 2000 in order to protect rare steppe grasslands. A lot of rare plants grow there, such as branched St Bernard's lily, fragrant orchid, fringed gentian (Gentianopsis ciliate), Inula ensifolia and many others.